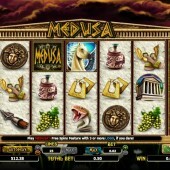 The Spielo game Medusa is a slot machine that has been popular in casinos for many years. Based on a character from Greek Mythology, the game features the lady with venomous snakes for hair. If the myth is to be believed then you might turn to stone if you gaze into her eyes, so be careful where you look. Following a development deal with NextGen Gaming, it was brought online along with other Spielo titles such as 300 Shields. The online version is slightly different to the land based slot machine, but it is worth noting that there is an improved RTP (return to player) online of 95.52%. Of the three bonus rounds available in Medusa, the one that generally proves to be the most rewarding is the Once Bitten Bonus. 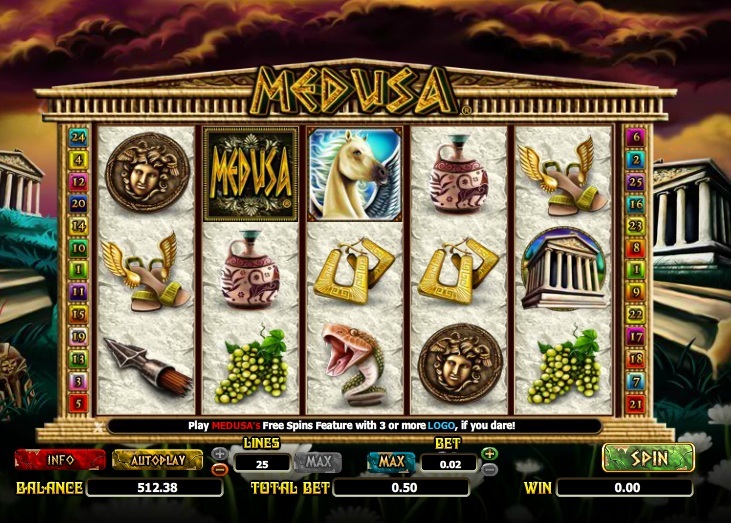 It is triggered by landing 3 or more scattered Medusa symbols anywhere on screen, which rewards 10 free games with a 2x multiplier on winning lines. If you land the soldier symbol on the middle reel during the feature then you will get extra Super spins at the end of the bonus where all wins are multiplied by 5! The Turned to Stone Respins feature occurs when the Medusa symbol appears on reels 2, 3 and 4. You get three respins with an expanded wild reel which is indicated by the figure of Medusa. All winning lines are tripled in this feature. The Pegasus Bonus is the third and final bonus round, which is activated when 3 Pegasus symbols land on the reels. You choose one to reveal up to 50x your bet. Medusa is a high volatility slot game, so you need to give it the respect it deserves to get the most out of it. Like other high volatility slots such as Playtech’s Great Blue and Novomatic’s Book of Ra, you can burn through your bank roll very quickly with little reward. You would be wise to start with smaller stakes and get used to the game before increasing.